A watchdog report shows that the U.S. Air Force saw a multi-year delay in the acquisition and deployment of “base in a box” kits in Europe due to poor planning and lack of centralized management, Defense News reported Wednesday. 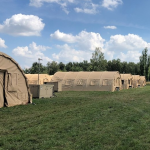 The service originally planned to field Deployable Air Base Systems, which provides easy-to-deploy facilities, equipment and vehicles, in fiscal year 2019. However, the inspector general of the Department of Defense found that the Air Force fell behind schedule and might deploy the first DABS kits by fiscal 2022. The IG said in the report that the delay comes as the service failed to assign a single program manager to handle the multiple organizations involved in the program. Watchdog added the Air Force also did not provide a “unified master schedule” for the acquisition and deployment of DABS across Europe. The IG said the issues would delay the completion of the program until fiscal 2026. The Air Force agreed to assign a program manager to handle the DABS program and provide the DoD IG with another timeline to pre-position initial 10 kits in 2021.